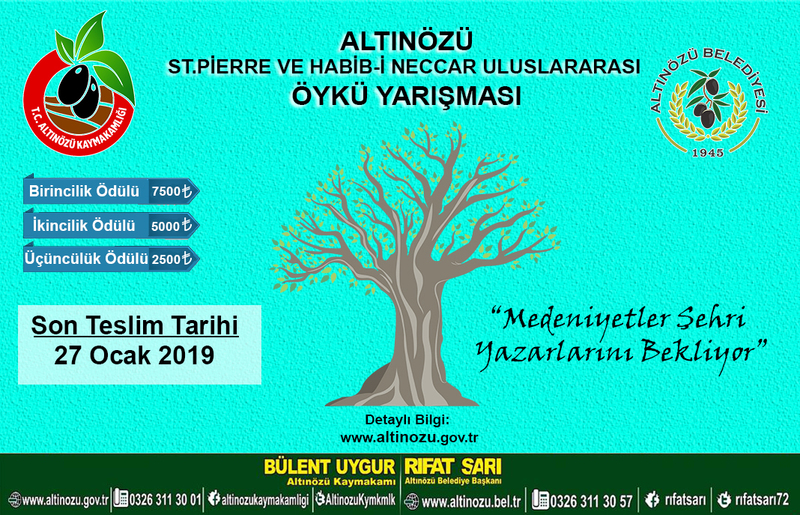 The Sub-Governorship of Altınözü and Altınözü Municipality have organized a story contest on the behalf of two faithful people, St. Pierre and Habib-i Neccar who lived during the same era. It takes places inAltınözü, the province of Hatay Turkey, which is located in southern Turkey,neighbouringto Syria Arab Republic, covered with olive trees more than fifty percent of arable land, hosting many people from different races, religions and sects. Objective: This story contest has been organized so that the lives of two people who do not know each other and enlighten humanity can shed light on us today. Scope:The competition is open to anyone (except the people referred in the first article of participation conditions). This competition process is carried out by the district sub-governor of Altınözü with the contribution of the Municipality of Altınözü. 1. Jurymembers and their 1st degree relatives cannot participate. 2. The works to be participated in the competition shall not be awarded before, and must be unpublished (both printing and online). 3. The story subject will be fictionalised about "Habib-i Neccar and St. Pierre's meeting in Hatay and the events around it". 4. In the stories; it will not be quoted from sources that have been described so far, from previously published writings, books, journals, in short, no sources. BUT; in myths, in the light of events previously published, in books, in the magazines, and in the Holy Books, the work will be COMPLETELY "ORIGINAL". Both heroes will be edited proportionally in the story. 5. Since the Holy books tell us about OLIVE and the main characters of our contest carry religious motifs; Also, ALTINÖZÜ is an olive field, 5-10 lines of olive or olive oil or olive trees should be mentioned. 6. Participants will be able to participate in the competition with no more than two (2) separate stories. 7.Volume of the episodes: Times New Roman font 12 p. will be 2.5 cm in top, bottom-right-left in the size of A4, with a margin of 0, 1.5 lines. 8. Stories should be at least 2 pages and no more than 4 pages. 9. The application will be made via the internet to altinozukaymakamligi2@gmail.com. 10. The authors will write their names, surnames, phone numbers, mail addresses, home and work addresses to the works they send over the internet. (Important: The works will be given to work numbersby the officer in our regional office before the jury is sent.) Your name, surname and all information will be deleted. So Judges will be notified by the jury at the end of the work.The scoring criteria will be added at the end of the work and the jury will evaluate the points with 100 points according to these criteria.In case of the highest scoring equality the 1st prize will be shared. 11. All rights (printing, sound, visual, etc.) of the works submitted to the competition belong to Altinözü District Governorate for 5 years. 12. In the contestant, 1st for 7500 TL, 2nd for 5000 TL, 3rd for 2500 TL + honorary grade + participation certificate will be awarded. From the 4th contestant to the 10th contestant will be given a certificate of honor + participation. From The 11th contestantto 20th contestant's will be given a certificate of participation. 13. The first 20 works will be printed in the collection book. 14. Competitors entering the top 10 will be invited to the awards ceremony. 15. Authors who submit the work to the competition are deemed to have already accepted the provisions of the specification. 16. The Works those do not comply with the above conditions will not be assessed. AWARDS CEREMONY: It will be held at Altinözü Municipality Culture Center on April 27, 2019- Saturday at 20:00. AWARDS CEREMONY PROGRAM: April 12, 2019 the invitations of the top 10 contestants and members of the jury will be mailed. 19.45 Move to the Cultural Center for the Awards Ceremony. 22.30 Guests are placed in the hotel and resting.